Which route do we take? We've been planning one of our "long" trips for the better part of a year ever since we found out my sister and her family were moving to Spokane, WA. She invited all of the family to meet at their new home in Spokane for Thanksgiving 2009. We jumped at the opportunity to take a long trip in the Newell, and to do a couple of weeks of exploring after Thanksgiving of some areas we have not yet seen, including the Olympic Penninsula. As the time for departure has come into view it has occurred to m e, and Elaine that the weather may have an impact on our trip plans. After all, this is the Pacific Northwest, which is known for a lot of rain and snow in late November, early December. Our route to Spokane was originally to hop on Interstate 15 (less than a mile from our home) and head north through Las Vegas to Salt Lake City, continuing north through a corner of Idaho, into Montana where we would pick up Interstate 90 near Butte, MT and head west to Spokane. Well......it has been snowing/raining on and off for the past 10 days from Butte to Missoula, with low's into the 20's some nights, and highs in the high 30's to 40's during the day. While I do not "fear" the cold, I'm not going to deliberately head into freezing temperatures, and snow, so now we are contemplating taking Interstate 84 northeast out of Salt Lake City thru Boise, Idaho through southeast Washington to Spokane where the temperature and weather forecasts are much more moderate with lows in the mid to high 30's and daily temps in the high 50's....still cold, but more pleasant to contemplate. 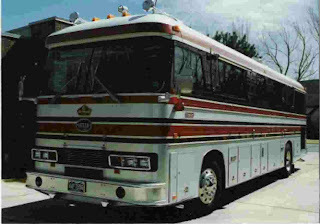 One of the complicating factors is that there is a Newell owner (Jennifer Stackpole) living in Missoula, MT, along our original route, and we would like to stop and visit with her and see her Newell Classic...I think it's a 1988. It appears that Missoula is at a lower elevation (some where in the 3,000' range) and should have a little more moderate weather than say Butte, or other towns east of Missoula on Interstate 90. So, what route we ultimately follow will be determined closer to our departure date depending on current and projected weather conditions. The route home will have to be made up as we go depending on current weather, and forecasts. I hope we can follow Highway 1 down through the Olympic Peninsula into Astoria, OR, but we will not know how that will work until it's time to leave Spokane. It's Thursday morning, and I sit here reading online journals of people who have escaped the gravitational pull of the work week world, and are living and travelling fulltime in their RV's. Elaine and I are a little less than 2 years away from realizing our dream to do the same. We've spent countless evening hours sitting by our outdoor fireplace planning, and talking about fulltiming. Six years ago we were not evening thinking in these terms. We had not owned an RV for 23 years, and our only camping experience during those 23 years was tent camping. When we travelled to our favorite vacation destinations we stayed in timeshares. We have owned a timeshare week in Palm Desert, CA for about 23 years that we have transferred that week to many other places such as Kau'ai, June Lake, Lake Tahoe, Washington, etc. In the Spring of 2002 my son and his wife had purchased their first travel trailer. He and I share an insurance brokerage office together, and he would come into the office every few weeks telling me about their latest weekend trip in their trailer. We owned a 26 foot Columbia sailboat at the time, and had owned it for 11 years at that point. That sailboat was our weekend getaway, but it was always in the same marina. 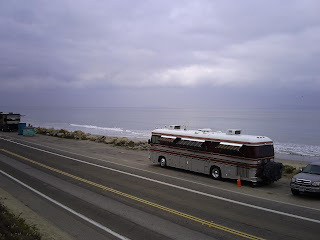 The idea of being able to go anywhere we wished began to appeal to us more and more, and a year later Elaine and I purchased our first motorhome, a 1987 Fleetwood Tioga 26' Class C on a Ford E350 chassis. It needed a lot of work, but we bought it with that knowledge. Over the next 4 years we travelled all over California, Nevada, Oregon and Washington taking several 2-3 week trips per year. We just completely fell in love with the RV life. Ultimately we decided that the Tioga was not big enough to live in full time and began to talk about what our next motorhome would be. About 3 years ago our son, who owned the travel trailer, bought a Fleetwood Expedition diesel pusher with 4 slides, which he still owns to this day. We love his motorhome, but buying something like that would require us to take out a loan, but we didn't want to add a monthly payment to our budget. We wanted to buy something for which we could pay cash. Based on our price range we felt we could afford a 10-12 year old diesel pusher, so we began to look in ernest for something in that price range. We spent a day at the 2008 RV Show at the L.A. Fairgrounds in Pomona looking at the various manufacturers to get an idea of who was making the kind of coach we wanted. We liked Country Coach, Monaco, and Safarai, so we began looking at used coaches made by those manufacturers. These coaches look great new, but after about 10-12 years they begin to look pretty threadbare. In most cases the wood cabinets, flooring needed refinishing. The upholstery was worn out. Quite by accident I stumbled across a 1982 Newell on Craigslist in the Palm Springs area. It was way older than I wanted, but the pictures really caught our "eye". We were planning on attending a wedding that weekend in the Palm Springs area,(February 2008) so made an appointment with the owner to "just take a look". I had never heard of the Newell brand before, but found a few articles on the web about the founder, and an owners forum that impressed me. Well, stopped by the storage facility where Fred Hornbacher, the "cu rrent owner" stored it, and he proceeded to give Elaine and I an hour and a half tour of the coach inside and out. Well, as I have written elsewhere on this blog, we bought that 1982 Newell 36' coach, and have never looked back. The picture at the right is the exact picture used in the Craigslist ad. We now spend time trying to divest ourselves of a lot of "stuff" that we don't need. I have been selling some of my bike "stuff" on Ebay, and have made some good money getting rid of the excess stuff. We will eventually tackle the stuff in the attic that has not seen the light of day for 10 years and get rid of "it". It's a long process, and even though I have made the adjustment in my mind to living in a smaller space, and living more simply, the actual execution of that will be a little more difficult, but we will get there. I am blessed being married to someone who is very flexible, and willing, no wanting to live more simply, so we will each have the other to cheer us on toward the finish line. Really, the finish line will the the starting line for our new mobile, simplified life on the road. I can hardly wait. One of our favorite fall/winter long weekend destinations is Rincon Parkway located just a few miles north of Ventura, CA (HWY 101 at Seacliff exit). 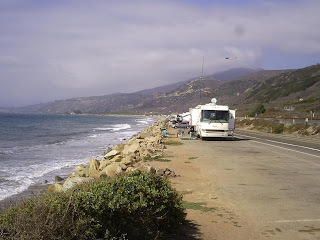 Rincon Parkway is a 6 mile stretch of the old Pacific Coast Highway that now provides access to several beach colonies, 3 Ventura County parks, and Emma Wood State Beach. Rincon Parkway is one of the County parks. The county has desginated approximately 125 RV only sites marked end to end. Each site is approximately 50' long. Only self contained RV's may park here. No tent, or car camping allowed. All sites are on a "first come, first served" basis. We do not even attempt to stay there from Memorial Day until Labor Day as the sites are continually taken, and the only way to get a site is to arrive Sunday afternoon as the weekenders are leaving. During the fall/winter time you can arrive on Thursday, or even Friday and usually get a spot. We decided to head for Rincon this past Thursday, October 9th, and spend 4 days enjoying the soothing sound of breaking waves, gentle breezes, spell binding views. We left home around 10am, and arrived, non-stop, at site #41 on Rincon Parkway around 12:30pm. There were no less than 2 dozen sites open, so we had our pick. After setting up we both settled down to do some work. This was the view I enjoyed as I worked on my computer the rest of the afternoon. In the following picture you can get a sense of how the sites stretch north, end to end, along the ocean. This section is almost 1 mile long. It is the only p lace on Rincon Parkway where ovenight parking is allowed. All other areas allow parking from 7am to 10pm. If you are caught parking overnight the fine is around $170. The daily rate for the designated RV parking where we stayed is $25 per day. A day is 24 hours from your time of arrival. So, for example, we arrived at around 12:30pm, so our 24 hours was up at 12:30pm the next day. Later that afternoon after it became "apparent" to me that the Dodgers would lose game 2 to the Cardinals, Elaine and I left on a walk south along the beach to Faria Park and back. On the way back I got an instant message from my oldest son simply stating "Can you believe it?!" I messaged back "Believe what? ".....he then messaged back that the Dodgers had "come from behind" to win the game by scoring 3 runs with 2 outs in the bottom of the 9th inning. What a great start to the weekend. The Dodgers would go on to win game 3 in St. Louis and sweep the Cardinals, which NO ONE expected, least of all me. 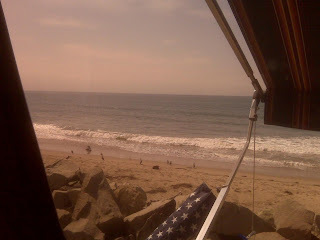 Upon our return to the coach I got out the Sea-B-Que barbeque and started to warm up to cook 4 filets from Costco. After dinner we built a fire and enjoyed the setting sun, and then watched as stars began to appear. Friday dawned very overcast, and did not clear up all day. We worked for a while, and took a walk, then worked some more, and then took another long walk. This was basically a repeat of Thursday ending with another enjoyable evening camp fire. On Saturday we decided to take a bicycle ride around Ventura. Elaine mapped out an ambitious route taking us down the coast about 13 miles, then looped inland to Old Town Ventura where we stopped for lunch at Anacapa Brewing Company, a local brewpub with great local beer, and a scrumptuous menu. We split a personal pizza, and share sweet potato fries with a sweet/sour dip. We each had a pint of their draft dark beer...don't remember the name right now. On our ride back to Rincon we stopped at the Von's supermarket and picked up some groceries. We arrived back at our coach around 3pm. We decided to forego our last evening fire, and save the wood for the morning, which proved to be a great choice! On Sunday we awoke to an even thicker marine layer, but the temperature remained steady at around 65 degrees by mid morning. We decided to use the last of our wood for a fire, and sat outside reading by the fire for a couple of hours. Around 1pm we packed up our chairs, and awning mats and headed back to Ontario. What a great, relaxing weekend! Getting ready to head for Ventura tomorrow morning. We hope to get a spot on Rincon Parkway, or in one of the County run RV parks on either end of the Parkway (Faria, or Hobson). No telling what we will find....it's still early Fall, and sometimes you have to arrive there on Wednesday to get a spot, especially on a holiday weekend (Columbus Day is next Monday). We have never tried to snag a spot on Rincon Parkway this early in the Fall, so this will be a new adventure. If we have to, we will spend the days and early evenings parked along the parkway in the "day use" areas, and then retreat to somewhere in town where there are large parking lots. We will scope the possiblities on the way into town for our night camps.